LONDON — Global shipments of large thin-film transistor (TFT) liquid crystal display (LCD) panels rose again in 2018 despite concerns of over-supply in the market. In particular, area shipments increased by 10.6 percent to 197.9 million square meters compared to the previous year, driven by TV and monitor panels, according to IHS Markit (Nasdaq: INFO), a world leader in critical information, analytics and solutions. Rising demand for gaming-PC and professional-purpose monitors boosted shipments of high-end, large panels. “Some panel makers have allocated more monitor panels to the fab, replacing existing TV panels, to make up for poor performance of that business,” Wu said. Demand for other applications, which include public, automotive and industrial displays, recorded the highest growth rates of 17.5 percent by area and 28.6 percent by unit. “Panel makers view these applications as a new cash cow that can compensate for the sharp price erosion in main panels for TVs, monitors and notebook PCs,” Wu said. LG Display led the area shipments of large display panels, with a 21 percent share in 2018, followed by BOE (17 percent) and Samsung Display (16 percent). BOE boasted the largest unit-shipment share of 23 percent, followed by LG Display (20 percent) and Innolux (17 percent), according to the Large Area Display Market Tracker by IHS Markit. 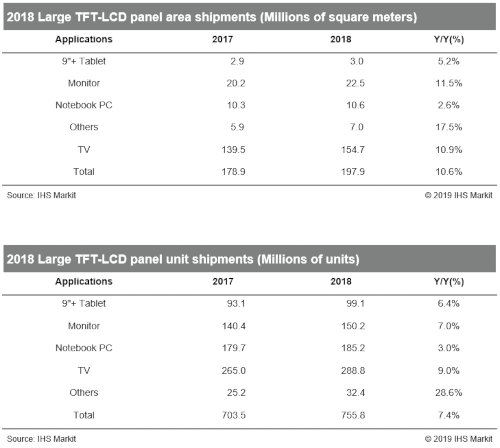 Large TFT LCD panel shipment growth is expected to continue in 2019. The preliminary forecast for unit shipments of three major products indicates that panel makers will continue to focus on the monitor and notebook PC panel businesses, increasing shipments by 5.3 percent and 6.6 percent, respectively, over the year, while shipments of TV panels are forecast to grow just 2.6 percent. In 2019, three new 10.5-generation fabs – ChinaStar’s T6, BOE’s second fab and Foxconn/Sharp’s Guangzhou line – are expected to start mass production. All of them are assigned to manufacture TV panels, further boosting TV panel supply. “As the TV panel business is predicted to remain tough, panel makers, who enjoyed relatively better outcomes with monitor and notebook PC panels in 2018, will likely focus on the IT panel businesses,” Wu said. The Large Area Display Market Tracker by IHS Markit provides information about the entire range of large display panels shipped worldwide and regionally, including monthly and quarterly revenues and shipments by display area, application, size and aspect ratio for each supplier.